Londonist asks that most pressing of daily concerns: where to go on your lunch break. Good, cheap, hot, fresh pizza. Last week’s lunchtime expedition on Goodge Street had us passing one of our favourite Fitzrovia standbys: Icco. 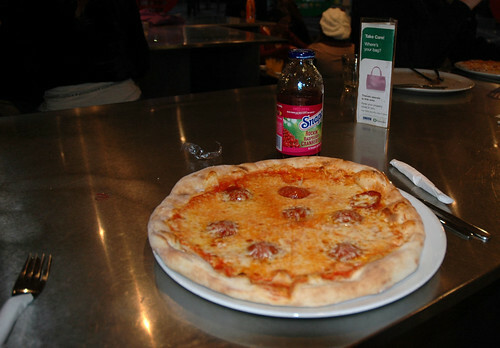 We really appreciate knowing that for £3.50 we can swing into Icco for a simply, filling margerita. We like Icco’s buzzy vibe too (and reckon it’s as close to a proper New York pizzeria that you’ll find in this town). Our inner big kid loves watching our pizzas get made, bakes, sliced and boxed right before our eyes. And, when our name “LONDONIST!” gets called to let us know our pizza’s ready, well, it's one of those wee thrills that helps us get through the monotony of our work-a-day life. For more reviews of ICCo, as well as thousands of other London restaurants, take a look at Qype.co.uk.